Sitkans of a certain age might remember a time when they could run across the airport runway to explore the former World War II defense site known as “the causeway.” Although access to the causeway is only by boat or kayak now, this summer the Army Corps of Engineers will restrict visitors while work is underway to rid the soil of of residual toxins from the 1940s. KCAW’s Katherine Rose reports. 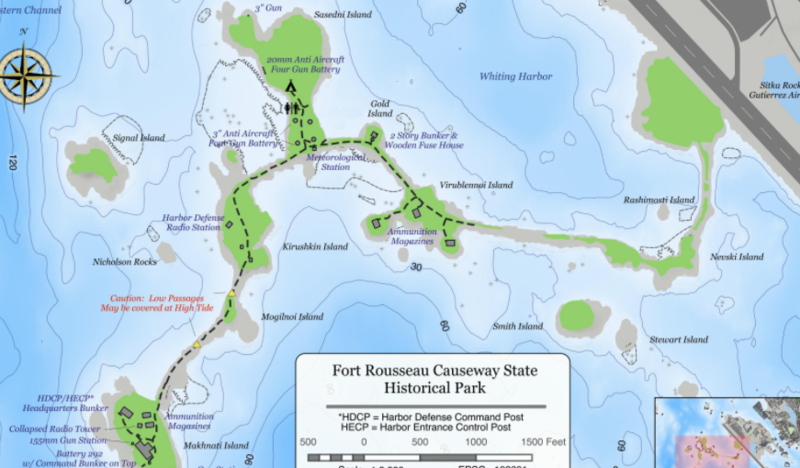 Ft. Rousseau was a part of Sitka’s harbor defenses during World War II, comprised of eight rock islands connected by a rock causeway. The site of a gun battery, it was closed in 1944. It became a National Historic Landmark in 1986, and is now a state park. And this summer, the U.S. Army Corps of Engineers is embarking on a project to remove contaminated soil from the park. Project and technical manager Aaron Shewman says they’ll be working to remove contaminants that were left behind by buried electrical equipment, as well as fuel and batteries. They also left behind lead from lead acid batteries that were improperly disposed of, and a toxin known as PCBs, or polychlorinated biphenyls, left behind by old transformers. PCBs are classified as carcinogenic to humans by the Environmental Protection Agency. Exposure to PCBs can cause skin conditions and according to the Center for Disease Control, some studies suggest prolonged exposure can cause liver damage. Shewman says that Sitkans who’ve used the causeway for camping or exploring shouldn’t be too concerned. KCAW reached out to a representative from the State Department of Health and Social Services, who said that without contamination data it’s difficult to know if recreational use of the area for 1-2 days a year presents a risk. But according to Lisa Geist — also with the Corps — who oversees formerly used defense sites — or FUDS — the concentration of PCBs in the soil at Ft. Rousseau is enough the state Department of Environmental Conservation stepped in. So the contaminants will be dug up, contained, and then they’ll come full circle and be buried again. The project to remove the lead, fuel, and PCB contaminated soil begins after April 9 The Corps of Engineers anticipates to complete their work in late June. In the meantime, the Corps is asking the public to steer clear of the causeway until the work is done and the site is contaminant-free. This story was updated on May 11 to reflect the new project timeline from the Army Corps of Engineers. They now estimate the Ft. Rousseau project will conclude near the end of June.